If you are a Torrent user maybe you like download some TV series, but the problem is you need monitor this TV show on Torrent directory site if you want download latest one. Now, maybe this small application can help you. Auto Torrent is a useful tool for Torrent download users, it special for you download TV show, because it can download files automatically. You can also use this tool to upload version of some applications. You can make a schedule for download. It supports schedule multiple downloads. 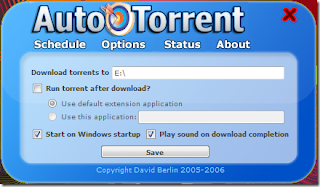 This is a useful Torrent download tool, it supports Windows system including Windows 7.